Gregorini’s second film, after Tanner Hall, is a fairy-tale with a deep soul. It isn’t the first, and won’t be the last, to deal with those who are and feel marginalised – those whose secrets and experiences create a behavioural tension with society’s norms but, with a light touch, Gregorini links them with important questions about motherhood: the absence of a mother, the loss of a child, the inability to have children. It’s an imaginative story, it has surprises and dark humour and it’s gorgeous to look at – a modern fairy-tale about souls, lost and empty, looking for connections and being saved by doing the saving. Emanuel is a “troubled” 17-year old who has never been able to shake off feelings of guilt and longing linked to the death of her mother as she gave birth to Emmanuel. She lives with her father, played sympathetically by Alfred Molina, and his new wife of a year – a benevolent and understanding woman but a stepmother that Emanuel can’t accept. But when a new neighbour, Linda – played by Jessica Biel, moves in next door Emanuel is captivated. She sees not just a single woman with a young baby but an ethereal, mysterious figure resembling her absent mother. Emanuel agrees to babysit and, from the moment she walks into Linda’s elegant bohemian home the two women are drawn to each other and the more Emanuel sees of the Linda’s complex inner world the closer and more protective she becomes. Gregorini avoids cliché. The stepmother is not a selfish schemer, but a primly fragile, caring woman with her own secret. Emanuel is “difficult” because she lives on the edge of sadness but she coolly delivers smug lines – a precocity that we laugh with or get irritated by – she is not the hackneyed child from hell. But the film does have its flaws: some of the dialogue feels forced and, sadly, it verges on Hollywood overstatement in the final sequence. That said, Gregorini is an honest storyteller and we are moved by how openly her heart is worn on her sleeve. She is sensitive to the fragility of the human, particularly female, psyche, and she knows beauty when she sees it. 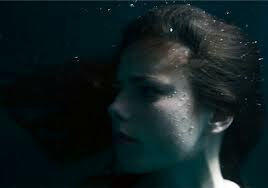 She pulls us in with lingering close ups of a stunning face or eyes or a dizzying 360 degree take or carries us away with an astonishing underwater sequence, when we experience fully the feeling of immersion but breathe easily. And Kaya Scodelario, last seen as Cathy in Wuthering Heights – where her beauty lost out to a vapid part, relishes the role of Emanuel, originally written for Rooney Mara, balancing perfectly a vast emotional range with deadpan humour. PS: for those kind enough to look at our posts we apologise for the hiatus. We’ve had some technical problems. We hope to post a review of several other Sundance films over the next few days. This entry was posted in Reviews in English, USA and tagged Alfred Molina, Emanuel And The Truth About Fishes, Entertainment, Film, Frances O'Connor, Francesca Gregorini, Jessica Biel, Kaya Scodelario, Movies, New US Cinema, Rooney Mara, Sundance London on May 1, 2013 by pabetterthandisneyland.